Mangroves, which globally span more than 150,000 sq km, are disappearing faster than any other kind of forests on the earth. Growing industrial and residential areas along the coastlines and discharge of waste to water bodies are the prime reason for destruction of mangroves. The forest departments have little manpower to spare for protecting mangroves and as a result, they are dying fast. 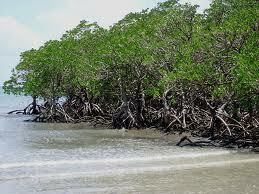 A natural breeding ground for several species, mangrove forests act as natural lungs and kidneys of the ecosystem. They play a major mitigating role in the changing climate scenario and time and again, their importance has been highlighted in buffering natural hazards such as cyclones, storm surges and land erosion. Research worldwide has established that mangroves are effective carbon sinks. One research in Florida says mangrove forests, that cover less than 0.1 percent of the global land surface, account for a tenth of the dissolved organic carbon flowing from land to ocean. Dissolved organic matter is an important player in the global carbon cycle that regulates atmospheric carbon dioxide and therefore, climate. Governments worldwide should take strong measures to ensure protection of mangroves and should declare them protected forests. Interdepartmental coordination among government departments such as departments of fisheries and forest and environment could play a great role in protecting mangroves. Community participation too could play a major role. The masses have to be made aware of the importance of mangroves in balancing the ecosystem, so that even they could participate in efforts of saving mangroves, and thus, the ecosystem and the earth. The Brutal Killing of Leopards Continues . . .